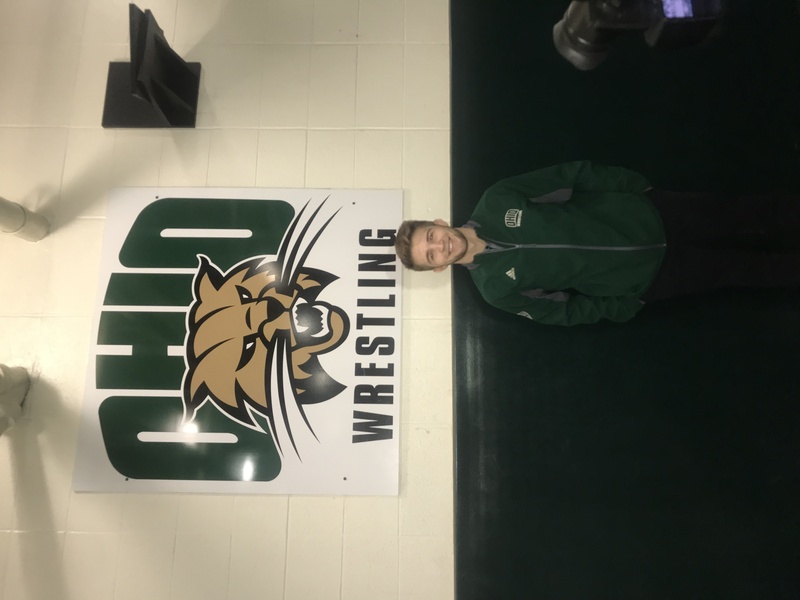 Ohio University wrestler Cameron Kelly had his Senior Day Saturday, February 9. 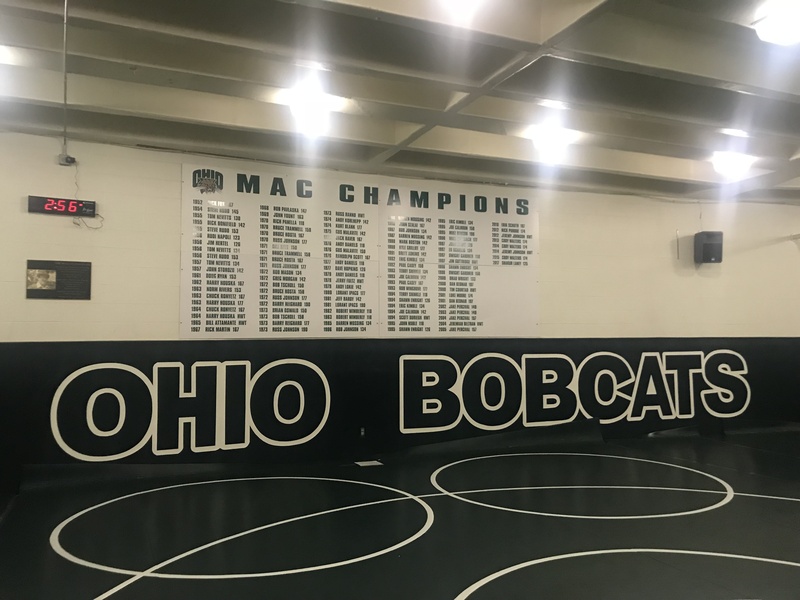 With a total of 84 wins in his college career, Kelly has made an impact on the Ohio University wrestling program. On Saturday he opened at 141 pounds, giving the Bobcats a 5-0 lead with a 19-1 win by technical fall over redshirt junior Lucas Bernal. Kelly is now 13-2 on the year, along with a perfect 7-0 in dual meets and 6-0 in conference meets. “He’s one of the first true freshmen to start for us. He’s qualified for the National, he’s been ranked top 20 in the country basically all four years here. It’s going to be a big night for him,” said head coach Joel Greenlee going into Kelly’s Senior Day. Greenlee said that they went to the high school state tournament to recruit and Kelly’s dad sat next to them. He told the coach that Kelly got hurt the night before and didn’t know how it was going to go. Kelly finished second in the state tournament and that is where Greenlee saw toughness and a guy who had had a lot of success. Kelly had a lot to say about how the OU wrestling program has helped shape him as a person. Kelly graduated from Bellbrook High School near Dayton. During his time there he was the wrestling captain all four years, was state champion in 2012, and state runner-up in 2013 and 2014. He was Bellbrook high school’s first state champion, had the most points and best winning percentage. Along with being a star athlete, Kelly was an Honor Roll student and taught pee-wee wrestling camps. 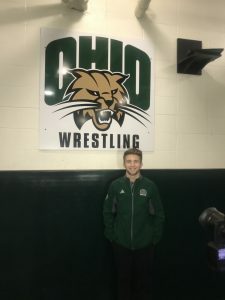 Following high school, Kelly committed to Ohio University for wrestling. In his 2015-16 season he posted a 23-9 record. He also won the Michigan State Open. In eight Mid-American Conference matches, he dropped only one match and finished with a 7-1 record. He went 2-2 at MAC Championships and finished in fourth place. Kelly qualified for the NCAA Championship as the No.13 seed at 133 pounds. In his 2016-17 season Kelly finished with a 23-11 overall record. He placed second at the Bearcat Open, second at the Navy Classic and seventh at the Midlands Invitational as well as the MAC tournament. His dual-meet record was 7-5 where he beat nationally ranked Brian Lantry. During 2017-18 Kelly had a great end to his season with his second trip to the NCAA tournament. He had the longest winning streak of his season with nine consecutive wins during a six-week span. His biggest win of the year was against Josh Terao in the American Dual. Kelly earned MAC wrestler of the week and a No.11 ranking from Intermat Wrestling. He finished the season with a 25-7 record, five pins, eight technical falls, and seven major decisions.